SHIPS to 48 STATES FOR FREE! "The ideas were endless and the options seemed so exciting"
"All three kids were fully engaged in working with the pieces"
THE TOYDLE KID’S FORT IS THEIR NEW FAVORITE TOY! Toydle kid’s forts will be the most played with toys in the house! The unique design makes it EASY TO USE, inspiring adventure and accomplishment in every child. These are the best kid’s forts for GIRLS and BOYS. Watching your child enjoy creative and adventurous play is guaranteed to warm your heart. 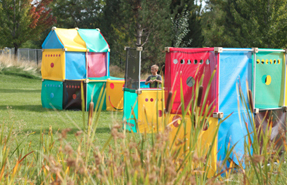 In fact, you will be tempted to build one yourself, but don’t worry, the Toydle Forts will last for years to come. 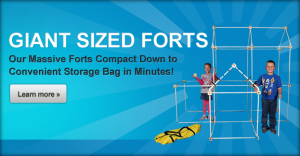 PLUS: THE TOYDLE FORT IS THE ONLY KID’S FORT WITH A LIFETIME WARRANTY! Connectors are made from friendly REAL HARDWOOD blocks and the sticks are VERY STRONG providing the SAFEST kid’s fort available. This is the best investment you will ever make for entertaining kids. 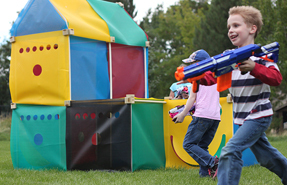 Get this kid’s fort today! ALREADY HAVE THE FORT KIT? Panel sets come in two sizes! 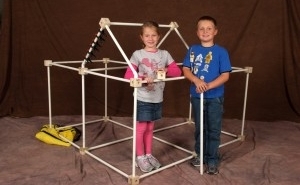 We make the best kid’s fort toy because it will last for a long time. 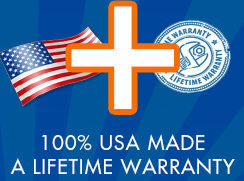 The Toydle kid’s forts are made in the USA and have a fully backed with a bulletproof guarantee. Give us a try and you’ll find out why our customers love us.